In 2007, a self-described “Jewish Kid from Long Island” opened his first ramen restaurant in Tokyo. 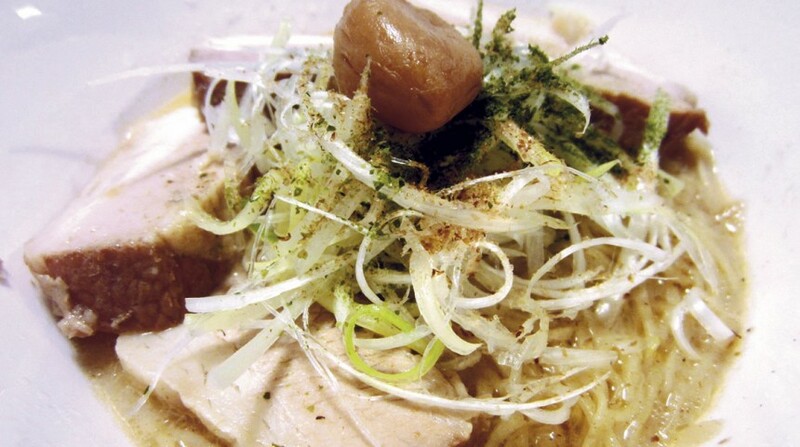 His restaurant, Ivan Ramen, serves a new, original kind of ramen—a fusion of East and West. The menu is simple, allowing the shop to specialize. It offers shio, shoyu, spicy red chili and roasted garlic ramen, along with shio and chili, sesame tsukemen (ramen dipping noodles) and a “ramen of the day.” Flavored rice bowls are also available for those who want a little extra. On a bustling Monday night, our ramen of the day was cold ramen with chicken, lemon and tomato (¥950). It was served in a chilled broth of savory tomato sauce with pulled chicken, a topping of seaweed powder and a lemon garnish. It’s not your typical ramen broth, and to our surprise, the noodles in this dish weren’t the standard wheat-based ramen noodles, either. Instead, the noodles at Ivan Ramen were the texture and consistency of linguine noodles with a subtle hint of “ramen-esque.” These noodles are Ivan’s own recipe, prepared by U.S. artisan noodle maker Sun Noodle. From the atypical broths to the custom-made noodles, Ivan Ramen serves an experience different from any other ramen restaurant in Japan. The chicken and tomato ramen was more like a savory tomato and spaghetti soup than a Japanese ramen dish. We continued with the roasted garlic chashu ramen (¥1,050). It was served in a steamy, thick broth, topped with a nest of onions, garlic and seaweed powder, four slices of slow-cooked chashu pork and a roasted clove of garlic. The dish was also served with Ivan’s signature noodles, suspended in the intensely flavored, creamy garlic broth. Drinks include “beer of the day” (¥600) and apple juice. Most evenings, you can also order homemade ice cream. There are two Ivan locations in Tokyo and two in New York. We went to the original Ivan Ramen on the border between Setagaya and Suginami; the second shop, Ivan Ramen Plus, is in central Setagaya. Don’t hold your breath to meet this ramen star, though: Ivan now resides in New York, where he runs Ivan Ramen New York and Ivan Ramen Slurp Shop.